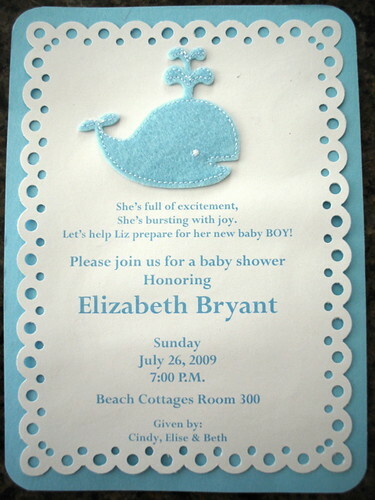 Baby Shower Invitation, originally uploaded by eabryant. These invites are simply beautiful. Gorgeous work. Wow. I am astonished at it's cute, simple, craftyness. I love it! so darling. i'm dying to know if the whale was sewn on? my mom's friend is a professional scrapbooker (yes, they do exist) and she sewed on pictures and such. i would never think to do that. either way, the stitching is so cute around the whale, and the little bubbles around the side. for sure one to frame in your little one's nursery. So cute! I really wish I could come! Hey - are you by chance coming here to visit in the near future? I'd love to throw you a baby shower here too! That is beautiful!!! You are so cute preggers!